I can remember 15 years ago when I first learned about the IBM San Volume Controller (SVC), and thinking to myself, why is every hardware company not thinking this way. The SVC simply made the hardware irrelevant in your storage environment by delivering a software defined model which allows you to manage a heterogeneous storage environment through a single pane of glass. In simple terms, all the smarts are in the software, so just buy cheap disk, or use your old stuff and manage it like a state of the art array. 15 years later, I now realize, that some hardware companies were thinking about this model, but who was really thinking about this was...software companies. One in particular that has made the biggest splash as evidenced by the recent Gartner Magic Quadrant for HCI is Nutanix. 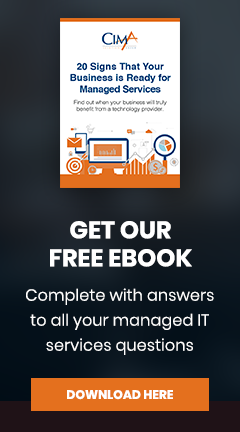 Cima believes in the benefits offered by a Software Defined Data Center, powered at the core by Nutanix. In one word, that benefit is SIMPLIFICATION. Cloud providers such as Google, Microsoft, and Amazon, build their service delivery data centers in a true software defined “cloud’ model. So we believe that each of our clients should evaluate moving to this model. A traditional “3-Tier” infrastructure often includes multiple management systems, multiple admins, and a much higher cost. 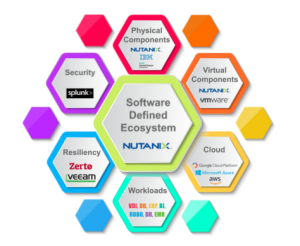 Delivering a true cloud model around Nutanix provides integration to the layers beyond the core interface, and freedom of choice from partners that are coming together to form a true Software Defined Ecosystem. We have delivered this vision or some form of it to many of our clients. It it is the pillar of our infrastructure portfolio and partners. In the weeks to come, I will feature a 6 part blog describing our POV within each layer, and what Nutanix is doing to integrate with the partners in this layer, and deliver natively through their own software elements. As we work with our clients, we will always to a cost benefit comparison leveraging our RightCloud Analysis tool. HyperConverged Infrastructure will always be included in the analysis. To learn more about our infrastructure vision, visit our page.